Today is the 71st anniversary of the Attack on Pearl Harbor. In honor and observation of the day, I am presenting to you two (pretty awesome) picture books which are World War II related, though neither specifically about Pearl Harbor. 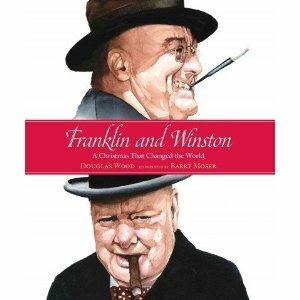 The first is Franklin and Winston : A Christmas That Changed the World, by Douglas Wood. This picture book - with perfectly beautiful illustrations by Barry Moser - is a fantastic treat. It picks up at Churchill and Roosevelt's first meeting - December 22, 1941. (Having previously ignored Churchill's pleas that America give aid to the British during the war, Roosevelt was finally motivated to meet with the Prime Minister after Americans had been attacked at Pearl Harbor.) Honestly I can barely think to figure out how to describe this book to you because I love it so much my brain is exploding in fireworks just thinking about it! My favorite shared quote from Churchill comes when Wood explains how Churchill was introduced to the American press. He was asked, in relation to the Germans, " . . . when do you think we'll lick these boys?" "Winston looked puzzled. An aid hurried over and translated the American expression. The prime minster smiled. "If we manage it well," he answered, "it will only take half as long as if we manage it badly." That's funny because it's so true! We're so impatient for things to be dealt with these days that we hurry along in a shoddy manner, barely completing the task or giving rise to others. Laziness and haste do not serve people or nations well. This book also shows one picture of Winston getting out of the bathtub, being wrapped in a towel. Roosevelt and Churchill had a habit of barging in on one another and Roosevelt entered Churchill's bathroom unnounced. "Think nothing of it," said Winston. "The prime minister of Great Britain has nothing to conceal from the president of the United States." How can you not like this guy!? His wit! His sarcasm! 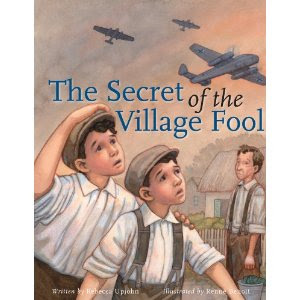 The next book I have to show you is The Secret of the Village Fool , by Rebecca Upjohn. Illustrated by Renne Benoit, this story takes place in a village in Poland. Milek and his brother Munio, young Jewish brothers, are charged by their mother to take some soup and a loaf of bread to Anton Suchinsky's house. The boys don't want to go because Suchinsky is thought to be a fool, always talking to animals and plants and refusing to eat meat. Their mother insists on good behavior and so off the boys go to run their errand, spending as little time talking to this man they see as being crazy. As they prepare to leave his house a neighbor approaches and starts ridiculing Milek, Munio and Anton for interacting, mentioning Hitler and how much trouble the Jews will be in once Hitler's armies arrive. Anton walks the boys home to keep them safe. War soon comes to Poland and Hitler's armies do, in fact, invade and occupy, sending many Jews into hiding. Anton Suchinsky, the village fool, turns out to be quite brave indeed as he takes Munio, Milek and their family into his home and hides them during the duration of the war. The best thing about this book? It relates a true story! There really was an Anton Suchinsky and he really did hide Munio and Milek Zeiger, along with their parents. Truly this is a tremendously beautiful and inspiring story and one which I can happily recommend to you and yours. I've been keeping an eye out for picture books about World War II, as it is a time period in history that I find myself drawn to learning about. I look forward to sharing these books with my children when they are a tad bit older and talking about the dangers of failing to do right in a world that too often tolerates injustice. :) I am realizing how much we need this type of books to gently immerse the kids in history. And quite frankly, I know very little myself. These both sound like great resources. If the first of the books implies that the US didn't contribute in WWII until after Pearl Harbor, that is a bit of the wrong impression. Lend Lease and other indirect assistance were important before that. You know how much I love Churchill and his pithy wit, though. Thanks for sharing the quotes. Both books sound really good. You should totally name your next kid Winston! Or a dog. Either would be awesome. Both sound fantastic! Our WWII children's books collection is definitely lacking. Thanks for sharing--they sound great, first one especially!